Foton, one of the largest motor manufacturers in the world, improved on its performance in the gruelling Dakar Rally at its third attempt in the 2016 event, which ended in Rosario on January 16. This year the company entered a Tunland pick-up and a Sauvana SUV, which is based on the Tunland. The Sauvana will be arriving in South Africa later this year as an addition to the local Foton range. Both vehicles were crewed by Chilean teams with Rodrigo Moreno and Diaz Araya taking 42nd place in the Sauvana and Alvaro Chicharro and Patricio Legarreta taking 51st spot out of the 67 cars which completed the two-week rally in Argentina and Bolivia. Taken into consideration that 117 cars started the 2016 Edition of the Dakar, just finishing the recent Dakar is certainly an accomplishment in itself. The second week in this year’s Dakar proved especially tough for competitors, with high temperatures and soft sand taking its toll on man and machine. Getting through these difficult stages in Bolivia, where a lot of competitors had to call it a day, was yet again testimony to the inherent toughness and all terrain capability of the two Foton vehicles. Foton was the only Chinese manufacturer to have a 100% finishing record with its two entries in Dakar 2016. 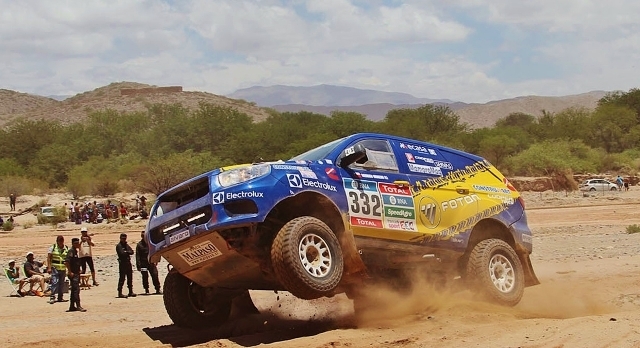 Foton debuted on the Dakar with a Tunland driven by Chicharro on the 2014 event. Unfortunately the vehicle was disqualified when its support truck ventured onto the racing route. Last year the team fared better taking 57th and 59th positions with two Tunlands. Chicharro, who now has three years’ Dakar experience driving a Foton, said on the podium in Rosario at the end of the 2016 rally that he is pleased to have completed the tough event again and that Foton was improving its performance year by year.